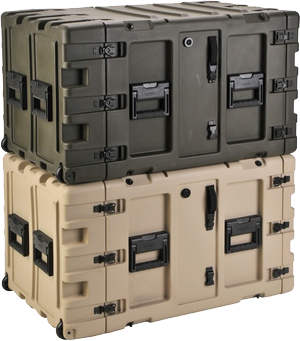 Our tactical units come in transport cases with removable shock racks that are available in 7 sizes: 3U, 4U, 5U, 7U, 9U, 11U and 14U. These racks are light- weight, shockproof, watertight, dust proof, heat and chemical resistant; perfect for protecting and transporting your sensitive computers and equipment. Molded of Linear Medium Density Polyethylene (LMDP) that meets or exceed MIL-STD 810G, the cases include 8 or 16 elastomeric shock absorbers which allow a payload of 40 to 300 pounds. 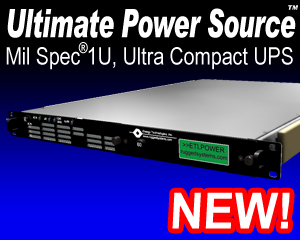 The Removable Racks are 24" deep from rail to rail with a standard 19" rack width, allowing easy access. The rugged roto-molded shell ensures strength and impact resistance. Edge casters allow convenient case transport. Molded-in ribs and lugs are designed to stack. Available in black, desert tan or OD green.